Networks could face hard questions about placing a quest for ratings above common sense and safety. NEW YORK — It’s a paradox of hurricane coverage: people on television spend days warning the public to get out of harm’s way, then station their correspondents squarely in the middle of howling wind and rain and hope they don’t get hurt. That was the case throughout Sunday’s gripping coverage of Hurricane Irma’s assault on Florida. Journalists were the shock troops allowing the nation to experience the storm from the comfort of their living rooms. Networks all brought their top teams in on the weekend for special coverage, non-stop on the news channels. Yet when a huge tree limb crashed to the ground behind NBC’s Gabe Gutierrez, forcing him to scurry away during a live shot, it illustrated the danger many journalists faced. Network executives were one flying projectile away from a tragedy that would have them facing hard questions about whether they were placing a quest for exciting TV and ratings above common sense and public safety. Several journalists who were outside sought the relative security of building balconies that blocked some of the wind or, like NBC’s Kerry Sanders, a concrete parking garage. Yet many felt they couldn’t truly convey the storm’s power without showing themselves getting buffeted by the elements. The rain “does seem like it’s getting shot through a fire hose at you,” said CNN’s Chris Cuomo, assigned to Naples, Florida, as the intense eye wall passed over him. NBC’s Miguel Almaguer had a yellow tow line, one end wrapped around his waist and the other around a concrete pillar, to steady him as he did a live shot. ABC’s Gio Benitez also employed a rope as he stood on a balcony. CNN’s Kyung Lah gripped a metal railing. Other correspondents frequently struggled to keep their footing. “I’m just taking a knee for a second,” Sanders said when the wind got too intense. NBC’s Jo Ling Kent seemed fearless walking around Miami Beach. CBS’ Elaine Quijano spied some debris blowing her way; fortunately, it proved to be only some palm fronds. The wind blew The Weather Channel’s Mike Bettes several steps as he stood outside in Naples; later, there was speculation that a small tornado blew behind him. But for a nerdy meteorologist, there was a payoff when he spotted a glimpse of the sun as the hurricane’s eye passed over him. 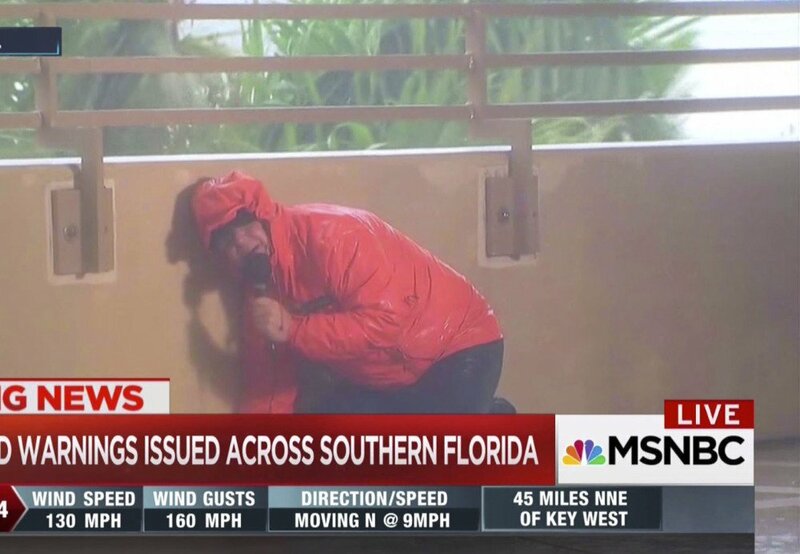 Bettes’ Weather Channel colleague Mike Seidel, assigned to Miami, seemed a gust away from real danger as he stationed himself on a dock overrun by water, as wind whipped around. He eventually thought better of it. “We’re going to be packing up and moving to higher ground,” he said. Fox News Channel’s Steve Harrigan earned the assignment to stand outside in a hurricane on his birthday. After a couple of hours getting water blown in his face, CNN’s Cuomo was comfortable enough to offer advice to a colleague on positioning himself for a live shot: don’t stand with your back to the wind. 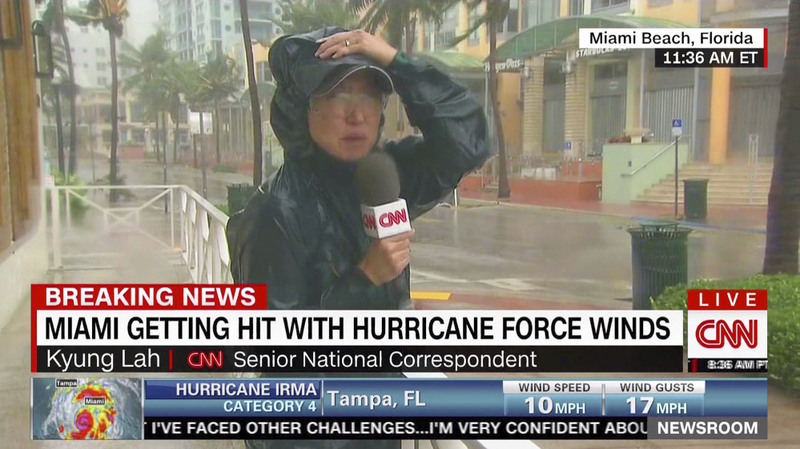 Cuomo’s experience passing through Irma’s eye offered some of the coverage’s most fascinating moments. Only minutes after getting hit by the worst of the winds, he found himself standing on a Naples street during a period of eerie calm. The palms stood limp beside him. He consulted with meteorologist Chad Myers, who was in a dry studio reading maps and estimating how many minutes Cuomo had until the wind would return, this time from the opposite direction. It wasn’t. The danger hadn’t passed for journalists or Florida, particularly as the challenge to capture storm surge added a fresh layer of risk.